Earlier this evening I cast my vote in the Scottish referendum. To be honest, I’m not sure I ever thought this day would come. I felt slightly woozy when I stepped out of the front door to walk up to our polling station. The first step on a new journey perhaps? I was ten years old at the time of the last referendum, two years older than my daughter is now. My memories of growing up in the Outer Hebrides and later in Glasgow in the 1970’s and 1980’s are a jumble of images and events; The Cheviot The Stag and the Black Black Oil, the oil boom years when Stornoway was filled with Norwegians gambling impossible sums at private poker parties, Scotland’s mortifying 1978 World Cup campaign, the bitter disappointment of the 1979 referendum, the Cold War and military build up in the Western Isles, the despair and disenfranchisement of the Thatcher years and the injustice of the poll tax. 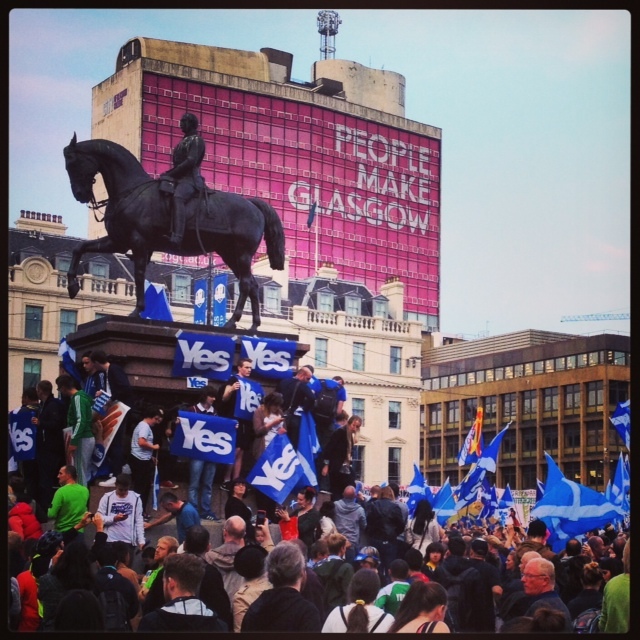 Nelson Mandela’s quote “May your choices reflect your hopes not your fears” has been widely used by the Yes campaign, while the No campaign has been overwhelming in its negativity. For me that’s what it’s all about, having the courage to choose hope over fear. What has inspired me most about the referendum, is the passionate political engagement of the Scottish people and the myriad voices that have spoken up for their beliefs on both sides of the campaign. I hope that whatever result we wake up to tomorrow morning that engagement will continue and those voices will still be heard. This entry was posted in politics, Uncategorized and tagged personal. Bookmark the permalink.